Saturday evening, after a day of the Mindful Leadership Summit and a two-hour nap, I decided to conquer my dining table turned desk. No easy feat. When I begin makeovers like these, the pets and Le Beau tend to take cover, knowing that chaos is about to ensue. This time, it was organized chaos. I began by adjusting my established creative space set-up near the window to accommodate my daily desk needs versus my occasional stamping, art journaling, and painting. The above pic shows the process with my laptop basking in its very own surface space and piles of pens, markers, and scented pencils, smencils (seriously), being carefully sorted. Often times we think of well-being as a plant-based diet, yoga, and a beautifully decorated home sans pet hair or underwatered foliage. I believe well-being includes a bit of chaos to bring about that coveted sense of order. 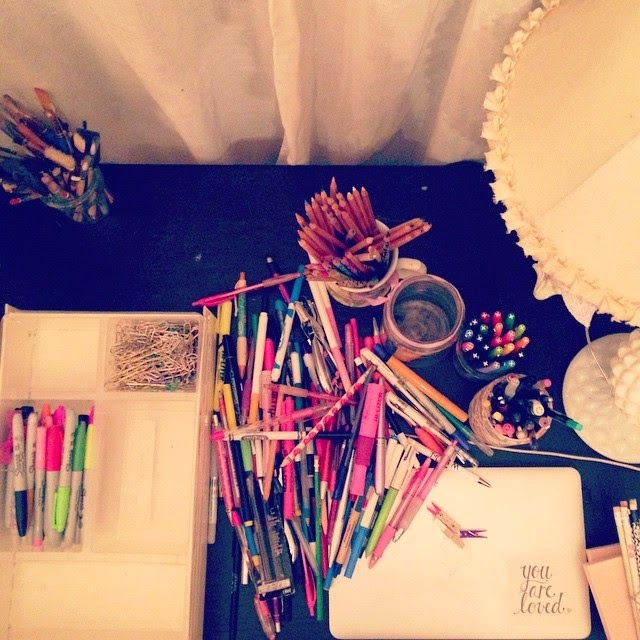 Sometimes the chaos comes in the form of late-night writing tools strewn about in anticipation of organization. Other times in the form of one too many sugary treats leading to a more nutritious greens-fueled meal to follow. Allow the mess to be a glorious part of your process. What small shift would bring about a state of well-being for you today? Is it the tackling of a catch-all drawer? The transition from a hot sugary beverage to green tea? The letting go of a relationship, project, or position that no longer resonates to make space for something new? Let the messy process be part of the shiny red apple product. Wishing you well-being today. And every day. Bisous. I love this post. You always have the most amazing things to say! "Let the messy process be part of the shiny red apple product." I absolutely LOVE this quote. Really- I need to copy it and post it everywhere. :) Thanks so much!